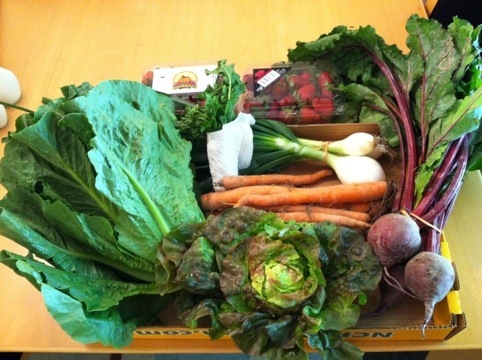 This week, our veggie fairy named Terri delivered a beautiful box of vegetables plus organic strawberries PLUS cheese. Right to my doorstep. Yes she did. 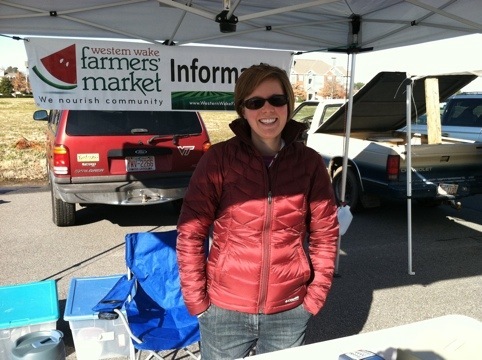 We are set to go with another week’s worth of fresh vegetables, including two kinds of lettuce, two pounds of carrots, beets, an herb bouquet, two quarts of strawberries and a local cheese that is similar to asiago. YUM! So, what to do with two pounds of carrots? I’m thinking of…pickling! But of course! Pickled carrots sound yummy and will be a continuation of my learning all things pickle. These are supposed to be spicy pickles, which sound pretty good to me. I’m NOT posting this idea on Facebook 🙂 If that doesn’t work out for some reason, I’m thinking carrot soup. What would YOU do with 2 pounds of carrots??? Not sure which cheese you would love? You can try 'em before you buy 'em! My child is in love. With a cheese. Really, it could be worse, right? This sweet infatuation began at the Western Wake Farmer’s Market, where we visited the booth of artisanal cheese makers The Hillsborough Cheese Company (hillsboroughcheese.wordpress.com). 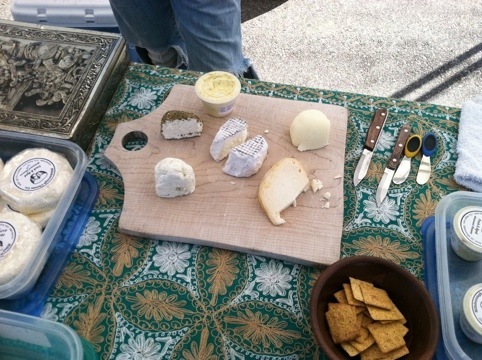 We had been looking for a local cheese source, and were thrilled to find the cheese booth, complete with tasting opportunities. We sampled a few and ended up purchasing some Eno Sharp for grilled cheese and some fresh mozzarella for pizza. Then, we tried the Bloomin’ Sweet Ash, an aged goat cheese that gets its ashy exterior from the application of a food grade vegetable ash. Really! They describe the cheese this way: ‘The result is a creamy, gooey layer surrounding a delicious, chevre-like spreadable center that alternates between notes of sweetness and bitterness.” My child believes this is the best cheese. Ever. I heard about the virtues and superior quality of this cheese all the way home. Apparently, I am going to be adding this to my list next week. Hillsborough Cheese Company offers a nice range of cow and goat milk cheeses made with locally produced milk. Their cow milk comes from Maple View Farm in Orange County, which sets the standard in our area for high quality, no growth hormone milk from pasture raised cows. Their goat milk comes from similar high quality goat dairies in the area. Cheesemaker Cindy West focuses on crafting European style cheeses and it appears that they have some standard offerings as well as some seasonal varieties that take advantage of available local ingredients. So how was the cheese? We tried the Eno Sharp in our grilled cheese last night and all of us agreed it was amazing. It had perfect melting qualities and a wonderful milky taste that was not overly sharp, but had enough flavor that we could really taste the cheese. Hard to describe (I’m not a cheese expert by any means). We would definitely do this again. The mozzarella is a fresh, hand stretched mozzarella that we used on our homemade pizzas. It was so much more flavorful than store-bought pizza cheese that I don’t think we’ll ever go back to shredded cheese in a bag. A $4.00 round of cheese made enough grated cheese for two pizzas, so that’s $2.00 a pizza–definitely within our budget. Hillsborough Cheese Company cheese is available at some farmer’s markets in the area–check their website for specific information. As for me, I’ll be heading out Saturday to purchase some Bloomin’ Sweet Ash for my bloomin’ sweetie.